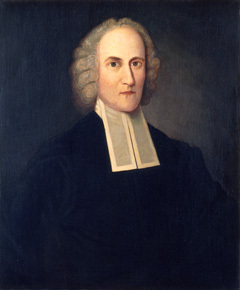 Jonathan Edwards, elected president five days after the death of his son-in-law, Aaron Burr Sr., was a popular choice. A friend of the College since its inception, he was the most eminent American philosopher-theologian of his time. Initially, Edwards refused to take on “such a new and great business in the decline of life,” explaining that he considered himself deficient in health, temperament, and some branches of learning. He was finally persuaded by a group of ministers that it was his duty to accept. He arrived in Princeton in late January 1758, where he preached in the College chapel and gave out questions in divinity to the senior class to study before coming together to discuss them — an 18th-century seminar. As author of the celebrated work The Freedom of the Will, he was respectfully received by the undergraduates, who spoke of the “light and instruction” he communicated.